BEAST, Orange Caramel, and IU were awarded the ‘Photogenic Award’ chosen by the camera directors at the ’11th Korea Visual Arts Festival’ which took place in Seould Yang Jae Dong, Seoul Education and Cultural Center, on December 1st. 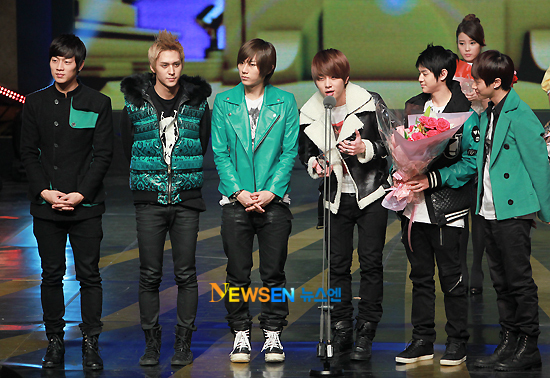 After the announcement of the award, BEAST said “It’s been a bit over a year since we debuted. Although we are not enough we thank all the camera directors who have filmed us nicely and cool. We will work hard to pay off for this award” with happy expressions. South Korea Broadcast Camera Directors’ Associations sponsored and managed along with Ministy of Culture, the 11th Korea Visual Arts Festival’ was made in the yearof 2000 by broadcasting camera directors for the cause of developing Korea Video Industry. The awards separate as amateur, professional, and photogenic. The winners of the ‘Photogenic Award’ were chosen through a voting system between the camera directors of broadcast productions, and were picked based not only on exhibiting great abilities in front of the camera, but by dominating in visual aesthetics as well in the areas of acting, talent, variety, singer, MC, and sports up tp 2~3 people. The 2010 Photogenic award was awarded to talent Ahn Nae Sang, Hwang Jung Eum, actors Jung Jae Young, Seo Young Hee, singers BEAST, IU, Orange Caramel, MC Moon Ji Ae, Ji Seung Hyun, variety Lee Soo Geun, gag concert bait team, sports Yang Joon Hyuk and Cha Yoo Ram. It is broadcasted as pre-record on December 5th, through EBS.